David is a member of the EEG. He works professionally carrying out surveys and dealing with problems arising from mobile phone masts and electromagnetic pollution. A recent visit to Belfast included an enjoyable and informative day with Billy Gawn. Billy dowsed the edges of the electric field from nearby overhead power cables, which we confirmed to be correct with a voltmeter. This gave me the idea to construct similar trials and compare other electromagnetic measurements with those dowsed by members of New Forest Dowsers. Using electronic equipment to detect radiations at ancient sites. Rain prevented an experiment with a spectrum analyser on a visit to the Rollright Stones, but I managed to use a hand held frequency counter under an umbrella and briefly minus the umbrella in case the frame influenced the results. This has three ranges 10 Hz -10 MHz, 10 – 500 MHz, 500-2500 MHz. On the lowest range a normal 228 Hz registered outside and about one metre from inside the stones, surprisingly the reading increased to 10 -11 KHz at the centre of the circle. 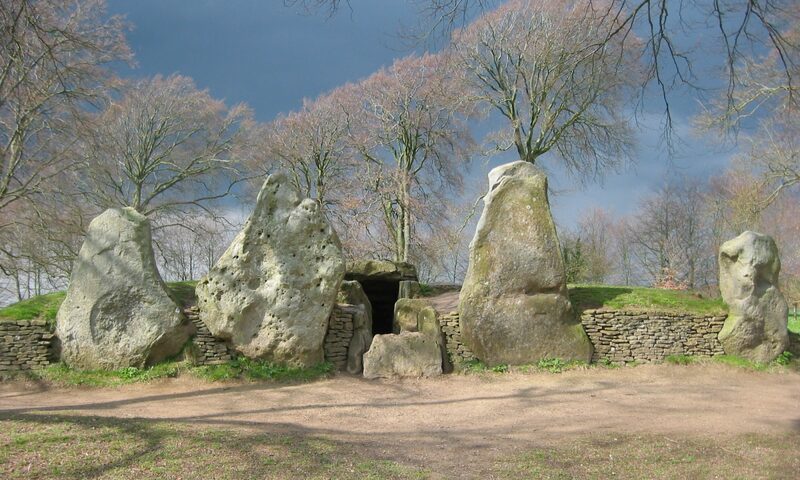 We plan to return to Rollright although some brief checks at Avebury proved fruitless. Attempting to use the spectrum analyser during three separate visits to Knowlton Church proved very weird and costly. On each occasion, the lid of the case slammed shut damaging the probe cable even though the lid was propped up during the later visits. A good way to treat inquisitive visitors. Knowlton Church pre-dates 1485 when the village was wiped out by the Black Death, and is sited at the centre of an earth mound which dates back to 2,500BC. As electro pollution, especially mobile phone transmissions increase, can we do anything to reducethese effects and protect our space? They can be reduced with Faraday screens, and hot spots avoided if you know where they are. When microwaves meet different kinds of material such as metal; hot spots can be created. One condition that 36 people within 500 metres of a mobile phone mast suffer, is a form of tinnitus described as the noise made by rubbing a finger around the top of a wine glass. The few I have questioned so far, say the symptoms are worst during days of very low cloud, or light winds, even on a fine day, and improve with high winds. They disappear with gales, and fog is the worst offender. This area is not subject to city type pollution as it is two miles from the sea. In other areas air ion changes are believed to travel down wind from 50/60Hz power lines, and other examples of the “ion effect” are well documented. It would be interesting to see if other evidence can back up these observations. Incidentally, I know of two people who has this “ringing” in the ears who sleep much better by using a type of Faraday net to cover their bed. There is one type available on the market and I hope to produce a similar one in the future made of four components. Microwaves reflected off metal structures sometimes offer measurable “hot spots”. Non-earthed metal, in particular motor vehicles act as an antenna even when the occupants are not using a mobile phone. Meanwhile, trees may attract, ground/earth, and screen microwave transmissions at long and short distances from the source. Draw a line on a map between large masts sited within seven miles. Not good news if you live on this line, but it helps if you are shielded with lots of large trees. A lady I know quite well, complained of dizziness and other stressful conditions fluctuating as she walked close to mobile phone masts. I asked her to walk a few steps ahead of me and around the site of these masts and call out the changes. These matched meter readings showing hot spots, some with a width less than a metre wide from approximately 75 metres from the mast. A survey we did of 500 homes lying within 500 metres of mobile phone masts produced 200 replies. Some did not wish to participate and pinpoint a blighted area as this might have devalued their properties. The replies presented strong evidence at a public enquiry brought by the council. Take a strong magnet and for a few seconds or more, hold north pole to the neutral pin of any electrical appliance plug, and south pole to the earth pin — both together. The appliance will be grounded. A muscle test should confirm this, but only if the person is allergic to the energy fields. I have used this method successfully over a period of twelve years to help ground electromagnetic fields from earthed and non-earthed electrical appliances. The benefits are noticed by those sensitive to electro­stress, and may well help others. It came about after my first visit to Peter who reacted to magnets stored in my car parked some four metres away. He mentioned a sensitivity to most electrical equipment. Peter and his wife were electro sensitive and both found this sensitivity decreased after neutralising every appliance in the home using this method. I believe it realigns the flow of electrons on a shorter path to earth via the plug and socket, and works for earthed and non-earthed appliances. Surveys of different types of buildings frequently reveal poor, or non-existent, earth bonding at domestic and commercial buildings, and occasionally an earth leakage from electrical supply sources. More serious earth leakage occurs via an ageing national grid from its overhead and hidden underground network — a scenario close to the heart of the EEG. In addition, radon gas is not confined to places such as Cornwall. It is probably not found in other areas because few bother to check for its presence during surveys and are unaware of its possible interaction with power cables. Geopathic stress is one part of a whole assortment of situations we need to address during surveys, all of which, I believe, are closely related.